Hello, everyone! Is it just me, or does the time seem to pass way too quickly these days? I could swear it was the end of September yesterday. Another “day” will go by and its going to be December already. Crazy! 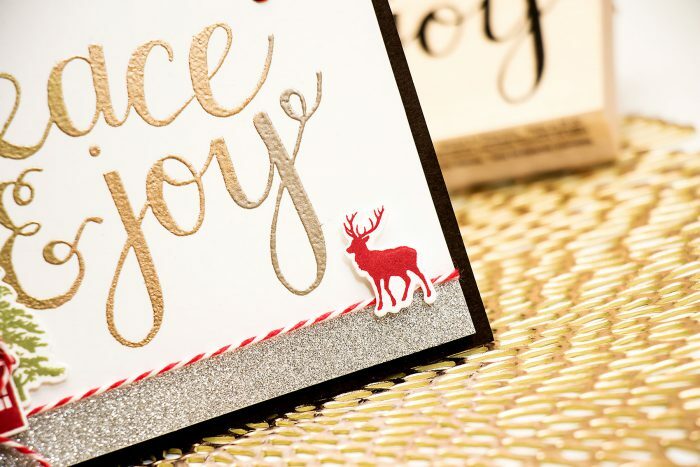 Anyhow, today I’d like to share a card with a fun heat embossing trick that I call ombre embossing. There’s ombre stamping, why can’t there be ombre heat embossing, right? 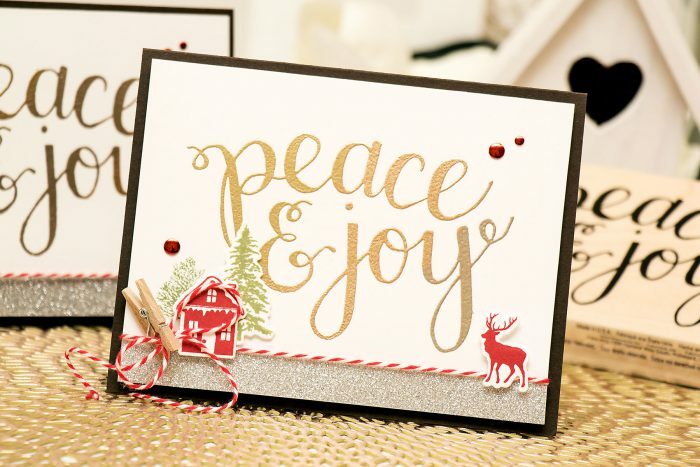 I used a gorgeous Peace and Joy woodblock stamp from Hero Arts and heat embossed it on a piece of white cardstock. I didn’t want to use just one color of embossing powder, I wanted more and I remembered a card (see photo below) I made last year for Hero Arts blog (their blog has moved since that blog post came out and it didn’t make it to the new address so I can’t link to it). 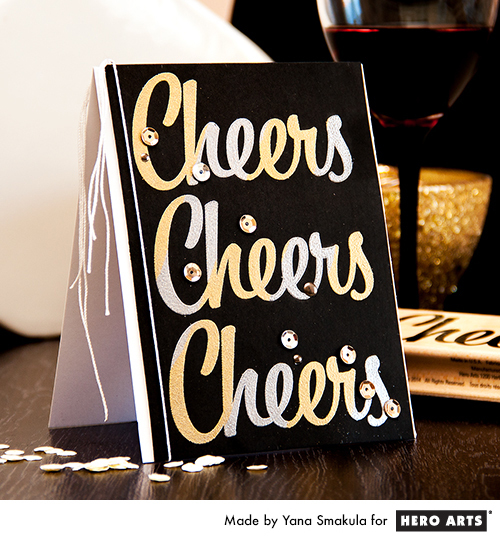 I used 2 colors of embossing powder – gold and silver and ended up having a bold embossed sentiment. I also added a simple snow bank to the bottom of my stamped panel using silver glitter tape that I got at Walmart for less than a dollar, tied red and white bakers twine, adhered a few red metallic dots and foam mounted my panel onto a dark brown cardbase. I’m sharing a video tutorial on my Youtube channel showing how easy it is to do ombre embossing. Like this video? Please give it a thumbs up and share, thanks! So cool! Perfect embossed gradient! 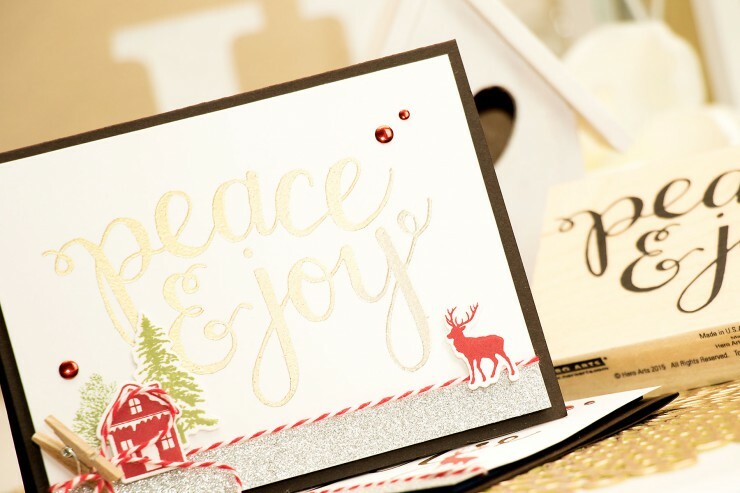 Like this bold sentiment along with other small and festive elements. Fabulous, Yana!! Fun technique, and I love how everything you’ve done with that Winter Scene stamp set!! This is so pretty. I struggle to use small images and you have paired this so nicely with the large sentiment. Great idea.